Spirit Scaffolding, LLC with 'in house' engineering is leading the Central Florida Scaffold Industry in quality and turnaround time for service. Engineering in conjunction with installation is an invaluable time saving asset. Engineering completed 'in house' is a valuable and time saving tool in the scaffold industry. Not only is 'in house' engineering cost effective for you the customer; but, beneficial because engineering and design - work hand in hand - to provide access tailored to your requirements and job needs. This results in cost control during installation and erection. 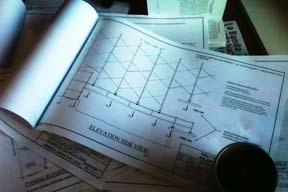 Scaffold engineering, a unique entity in itself, is an important element in determining degrees of liability and safety when applied to your job site. Wind loads and work platform loads are important governing factors for all scaffold engineering. In Florida, a state where wind gusts, thunderstorms and even hurricane conditions combine to make scaffold engineering and safety unified in priority. Since Spirit Scaffolding engineering is done in house with a certified Engineer with 24 years of experience IN THE SCAFFOLDING industry, we are able to adapt to your job requirements saving critical time and vital assets. Contact us today to fulfill your engineering requirements.